The future of learning and the future of work are converging. At a time when globalization, technological advancements, and social networks are reshaping our lives, they are also causing a rate of change that is outpacing human adaptability. This is what inspired us to launch Coursera for Business in 2016 – to partner with governments and organizations around the world in their efforts to transform the workforce in the face of accelerating change. Today,1,500+ companies and organizations use Coursera for Business as they upskill their employees to compete in the new economy. But there are still many parts of the world that have yet to benefit from the transformative learning content and experience of our enterprise platform. 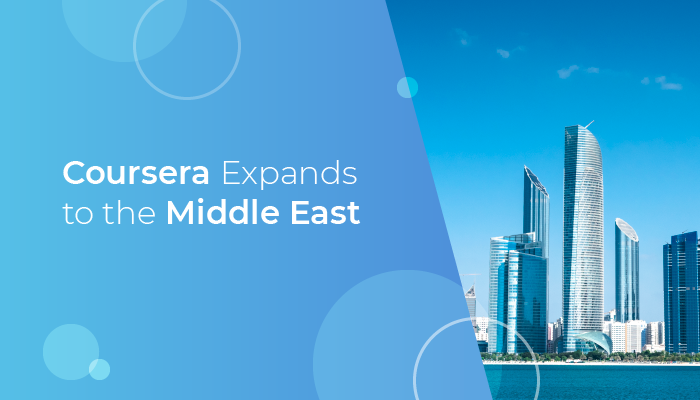 Today, I’m excited to announce that Coursera for Business is expanding into the Middle East – a region propelled by the boundless energy of 300 million people, but also constrained by a 31% youth unemployment rate. Coursera will be a strategic partner to government and major employers in the region, accelerating their efforts to develop a talent base that delivers on the ambition of becoming a knowledge-based economy, where the industrial base is no more dependent on natural resources but one that is powered by technology and innovation. We’re kicking off our expansion in the region with a number of public and private sector customers. Most notable among those is an ambitious partnership with the Abu Dhabi School of Government (ADSG) to train 60,000 government employees in critical leadership and technical skills such as data science, artificial intelligence, and digital transformation. As our largest government partnership to date, we are excited to see this become a global model for public sector skills transformation. Dubai Electricity and Water Authority (DEWA), Etihad Airways, TECOM Group, and Dubai Asset Management are some of the other major employers in the region who have partnered Coursera to upskill employees as part of their digital transformation roadmap. It is crucial to our mission that businesses, irrespective of their size, are able to access Coursera at their workplace; we’re thrilled to see that more than 35 small and medium-sized businesses in the region are using our self-serve platform to ensure their employees are up-to-date with the latest skills required to compete in their industries. To make our content more accessible to Arabic-speaking learners, we are offering 70 courses with Arabic subtitles and 30 fully translated, with more to come over time. Coursera will also be opening an office in Abu Dhabi under Zayd Badwan’s leadership to better serve the region. With the opportunity to develop a highly skilled workforce driving innovation, help transition the economy and become a strategic partner to government and companies in their efforts to invest in the future – we couldn’t be more excited about what’s ahead.